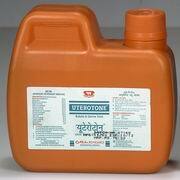 Uterotone, is an ecbolic and uterine tonic. 1. To facilitate expulsion of retained placenta. 2. As prophylactic after parturition for secretion of lothal discharge, timely involution of uterus and post – partum oestrus. 3. For treatment of metritis, endometritis and pyometra. 4. For treatment of anoestrus and repeat breeding. 5. To restore milk production associated with uterine disorders. Desmodium gangeticum, Uraria picta, Bambusa arundinacea, Solanum surattense, Solanum indicum, Tribulus terrestris, Stereospemum suaveolens, Premna mucronata, Gmelina arborea, Aloe vera , Ferrous Sulphate, Copper Sulphate, Sodii biboras. Cows and Buffaloes 100-125 ml. Ewe and Doe 20-40 ml. The dose should be administered orally twice daily for 4–5 days after parturition.In case of retention of placenta, the dose should be tripled and repeated after every three hours until the foetal membranes are expelled out. Explore more Cattle remedies products.